Announcement Happy Holidays from Moonfinder!! Enjoy free shipping now through Dec 10th! Happy Holidays from Moonfinder!! Enjoy free shipping now through Dec 10th! Very pretty, good detail, lovely color. Love love love :) ! I LOVE this ring set ! They look exactly as pictured. The Hyde park holiday market was a blast!! Thanks to everyone that made it out despite the wintery weather! Natural materials, ancient techniques & new technology. Hi I'm Kelly Stiles, designer and creator of Moonfinder. I've always been passionate about art and design, and much of the inspiration for my work stems from my love of nature. I feel very lucky to have grown up in the wide-open spaces of Texas where as a kid I got to camp, hunt for arrowheads, and do plenty of star-gazing. I was obsessed (still am!) with gazing at the moon every night, so my folks nicknamed me Moonfinder. I love working with a variety of natural materials and using ancient crafting techniques like marquetry, leather-working, and marbling. 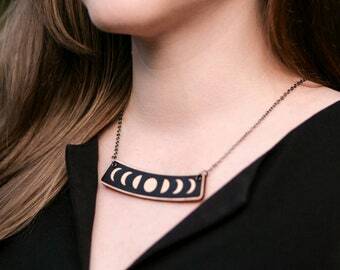 My products are mysterious yet playful, minimal yet intricate, and functional yet offbeat. My company would not exist without the support of my family. My mother, an artist herself, has always nurtured my creative abilities, and she's still my favorite person collaborate with. Also my wonderful husband supports Moonfinder in so many ways, in everything from building our web presence to his amazing photography. 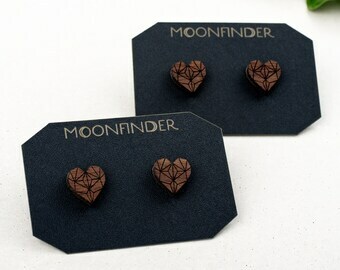 Moonfinder started in 2017 when we got our first laser cutting machine. This new technology quickly became a natural extension of our making process and allows us to experiment with a wide variety of materials, and to prototype our ideas quickly. It all begins with a simple idea which is developed, digitized, laser etched or cut; then each piece is assembled, sanded, dyed, and finished by hand. Everything is made in our humble Austin, TX studio. We care about our footprint and we feel that one of the best ways to prevent waste is to create beautiful, functional products that will last a long time. We strive to always use high-quality, sustainably-harvested, natural materials and eco-friendly, safe for skin-and-hair finishes. A nature-loving southern gal working and living in beautiful Austin, Texas with my husband and our three fur babies. We can do custom and personalized orders for an additional charge, send us a message with your ideas! We use natural waxes and oils to seal and condition our wooden jewelry. They can be occasionally re-conditioned especially if wood is looking dull or dry. We recommend using natural and organic conditioners even household items like olive or coconut oil work great! We typically use tung (nut) and linseed (flax) oil. While uncommon, these natural oils can cause an allergic reaction for people with sensitivities to nuts and seeds. We can use alternative finishes if you prefer. Just send us a message with any questions or concerns! Each order comes with our custom packaging, ready to enjoy or gift! We are available for wholesale orders, please send us a message for more info!